Curry Stuffed Sweet Potatoes! Such a healthy and delicious meal! 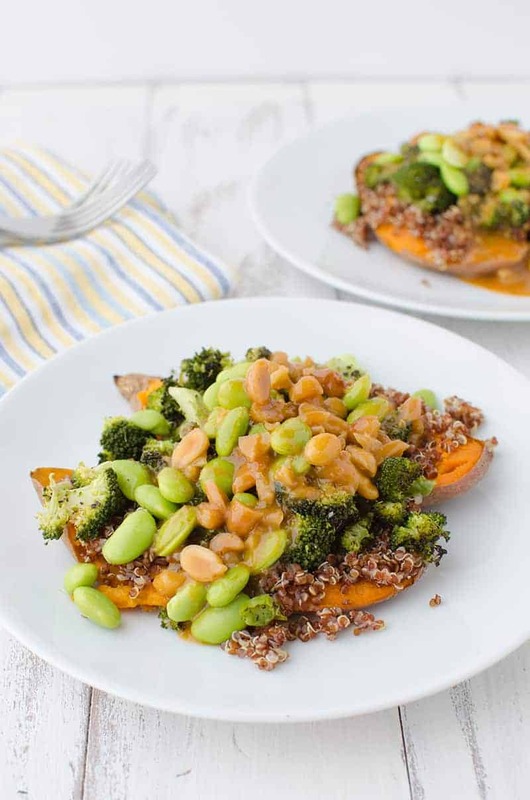 Baked sweet potatoes topped with quinoa, broccoli, edamame and a red curry peanut sauce. 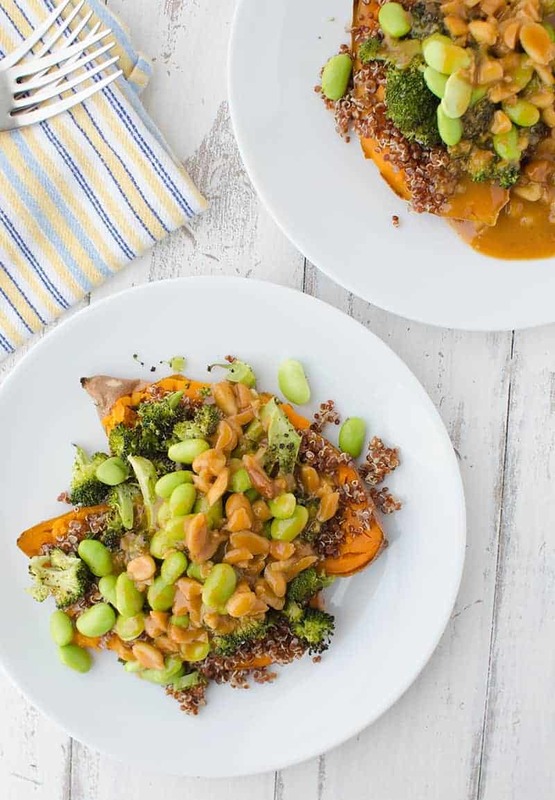 I’m pretty sure I already won you over at Red Curry Sauce but just for kicks and giggles, let’s chat about this sweet potato dish. 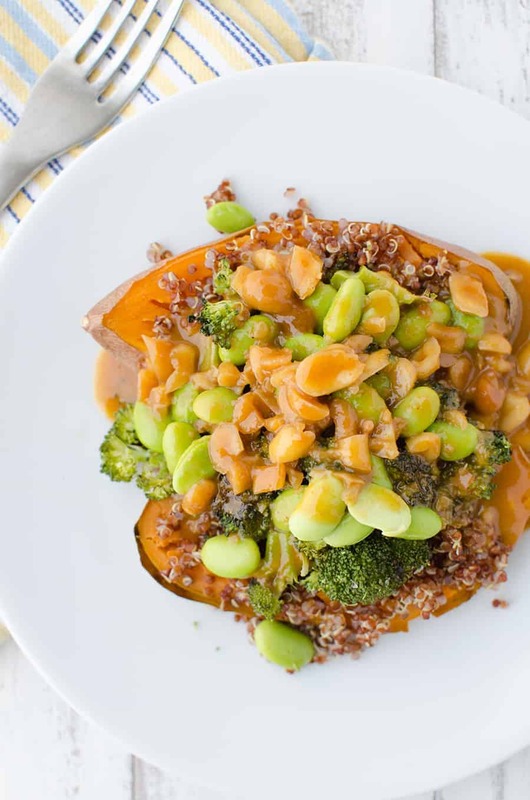 Quite possibly the most perfect dinner, we start with a roasted sweet potato topped with quinoa, broccoli, edamame and a healthy dose of red curry sauce. Simple, delicious, incredibly healthy. While terms like ‘detox’ make me cringe every time I hear them, if I was a fan of the word- I would use it here. A dinner that’s the perfect “reset” button to overindulging and overeating. You guys, this sauce. I’d be lying if I said that I didn’t intentionally create this recipe just so I could have this sauce again. It’s no secret that I have an intense love for both coconut milk & vegetables, hence me making this curry sweet potato over and over again. I first made this quick red curry sauce for my Thai Vegetable bowl and knew it would be perfect on sweet potatoes! Since we eat Thai takeout pretty regularly, I’ve become a self-proclaimed expert on red curry. While I adore it with broccoli, carrots, and snow peas, I get really excited when I see sweet potato and red curry on the menu. Combining the two is the perfect balance of both sweet and spicy. 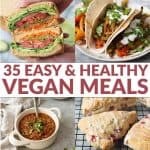 Quinoa was added for extra fiber and protein. You know, a balanced diet and all. This super simple super is incredibly healthy and packed with nutrients. Besides being vegan and gluten-free, each potato contains 12g of fiber and 15g of protein for around 500 calories per serving. You’ll also get 50% of your daily iron needs along with over 100% vitamin C needs. 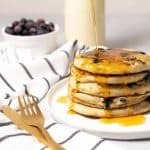 With all that fiber and protein, this meal will keep you full for hours. I think you are going to love this one as much as I do! Wishing you a great weekend full of fun & delicious food! I am excited for a low-key few days at home that includes a date night, coffee with friends, and working on a few DIY projects. Preheat the oven to 400 degrees F. Add the sweet potatoes and roast until tender, about 40-60 minutes depending on the size. In a medium sauce pan, bring the coconut milk to a simmer over medium heat. Whisk in the peanut butter, curry paste, soy sauce, sesame oil, lime juice, maple syrup and minced garlic clove. Continue to whisk over medium heat until sauce is reduced by half and thick enough to coat the back of a spoon. Add in the crushed peanuts and set aside. While the sauce is cooking, toss the broccoli florets with 1 tsp. olive oil and pinch salt and pepper. Roast in the oven until toasted, about 15-20 minutes. Combine the quinoa and water and bring to a boil in a small sauce pan. Cover, reduce heat to low and cook until tender, about 12 minutes. To serve, slice each potato almost in 1/2. 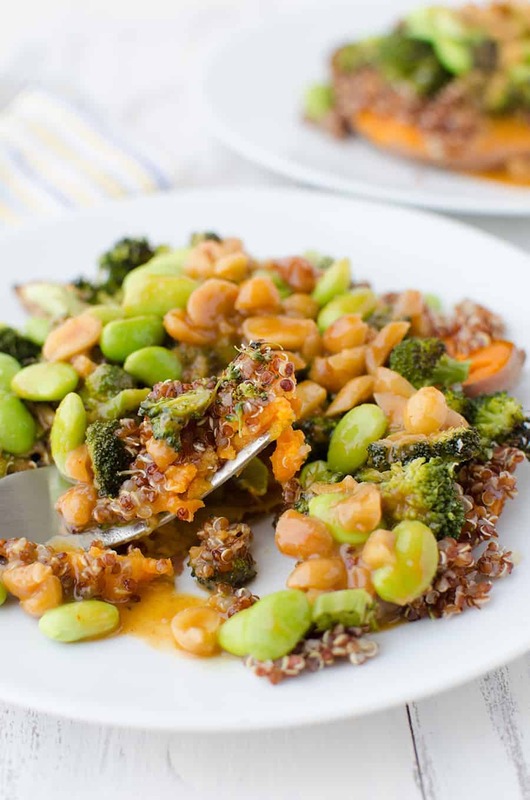 Layer with quinoa, edamame, and roasted broccoli. Cover with peanut sauce. Yes! This sauce! I want this dish for dinner this week! 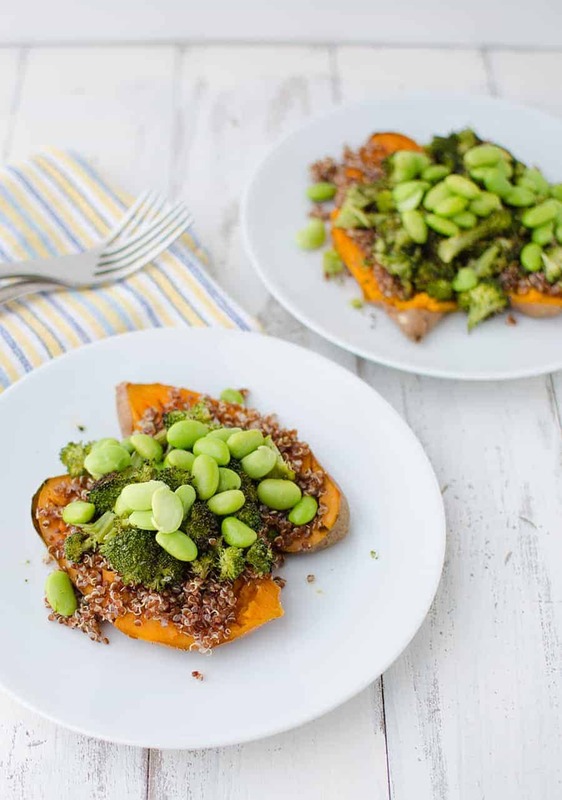 I’m pinning this to remember to make ASAP – I love that you’ve lightened this up with sweet potatoes and quinoa.